The Makita DLM431Z is a cordless rotary lawn mower suitable for small and medium size lawns. A cordless design allows for easy operation, while a huge range of cutting heights ensures you get the perfect cut time and time again, with a host of other great features rounding out the impressive DLM431Z. Although powered by an electric motor, the DLM431Z still has ample power for mowing lawns in small to medium size. The Makita 36V DC electric motor drive system produces an impressive 36,000 RPM, producing lots of speed and power for the 43cm cutting blade. One issue with electric mowers if that they often lack the bite to mow tough grass or even lawns, but this isn’t an issue with the DLM431Z. Yes, it’s not ideally suited for larger lawns and may require more strength to operate on a sloped lawn, but for most average gardens it’s got everything it needs to perform adequately. Perhaps the most impressive aspect of the DLM431Z’s electric motor is the ability to be powered by batteries. The DLM431Z is powered by two 18V lithium-ion batteries, which are sold separately from the main lower. Lithium-ion batteries such as these are the best performing on the market, offering impressive run times while also recharging quicker than any other type. In the case of the DLM431Z’s 18V LXT 5.0Ah BL1850 batteries, you get up to 30 minutes of run time in a single charge. As the DLM431Z is designed to mow average size lawns, this is more than enough power to mow most medium lawns, while likely have some juice left over from smaller lawns. Therefore, it’s very convienent, as cordless mowers are generally much easier to operate. For instance, manoeuvring around a cord is quite the task, especially in lawns with uneven shapes or various objects to navigate past. When combined with the lightweight build (just 18.3kg), the cordless design of DLM431Z makes mowing easier than ever. Another great feature is the soft start function. This suppresses the start-up reaction of the DLM431Z, placing less strain on the internal gears, helping to increase the longevity of the mower. It also makes for a much smoother start-up and mowing, which is always a good thing. To further enhance the durability of the DLM431Z, Makita have included their Extreme Protection Technology (XPT). This ensures the elements have minimal impact on the DLM431Z, allowing for easier mowing even in dusty or damp conditions. Mowing is made easier and the engine last longer – a win-win! Of course, the DLM431Z has the features you hope for in a good lawn mower, including variable cutting heights. In fact, it’s has one of the largest choices of cutting heights of any lawn mower, with an incredible 13 available! Granted, these are small increments, but this makes all the difference when aspiring for that perfect year-round lawn. Cutting heights need to be changed throughout the year, taking things like the weather, blade length, and grass type into consideration. So, it always helps to have plenty of options to accommodate your own lawn, which is precisely what the DLM431Z offers. Cutting heights range from 20mm to 75mm, which are quickly adjusted using a simple single lever. So, whether you want to take a small amount off during your weekly mows or need to take a good amount of length after the winter, the DLM431Z makes it quick and easy. 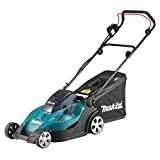 A host of helpful features round out an already impressive mower. A 50L grass collector offers plenty of storage for clippings as you mow, while the grass indicator means you don’t need to guess when its full. Ball bearings included in the wheels increase durability, and the handle of the DLM431Z is collapsible for easy storage. An electronic current limiter means the motor can’t overload, and the low vibration and noise produced make operating the DLM431Z comfortable and noise-free. All in all, the Makita DLM431Z is a great mower. Cordless for easy maneuverability, the lightweight design makes it one of the easiest operate, which is ideal for anyone that tires quickly with a heavy model. Variable cutting heights make it possible to get that ideal lawn length throughout the year, while the impressive batteries mean you can get most lawns done in a single charge without any hassle.